If you want to download the latest debug build, click here! The next build will be uploaded on April 15th. Did you guys enjoy the April Fools videos? I sure hope you did! The newest addition to the game is something that I teased two weeks ago: kidnapping! When you go to class, you will be given the opportunity to allocate “study points” in certain subjects. If you increase your Biology grade, you will be able to use a tranquilizer under the right circumstances. You can increase your reputation at school by talking to students and complimenting them. If your reputation is high enough, you can ask a student to follow you around school. If you increase your Biology grade, steal tranquilizer from the nurse’s office, lead a girl to the gym storage room, close the door behind you, and stick a syringe into her, you can knock her out and stuff her into a case. After tranquilizing a girl and stuffing her into a case, Yandere-chan will automatically transport that girl back to her home, and the girl will become a prisoner and appear in Yandere-chan’s basement. Added a “Sponsors” screen before the title screen to acknowledge people who are helping significantly to fund the game’s development. Changed the wording at the pink screen that appears before the game loads. Added a placeholder school nurse (that the player cannot interact with). Added “Ask Favor” menu when interacting with students. Gave the player the ability to open and close doors. Added the ability to compliment student NPCs. Gave NPCs the ability to open and close doors. Made reputation persistent across week days. Added a really crappy-looking nurse’s office. Added a gymnasium to the school grounds. Added one unfurnished classroom interior. Added a grim, dark, edgy Easter Egg! Added a new title screen. Fixed bug that would make the pause menu get stuck onscreen if the player paused the game right when the police timer hit 00:00 or school clock hit 06:00. If you are talking to an NPC while bloody, you will not recieve a reputation penalty while you’re conversing with them. Fixed bug that would occur while pressing the Escape key at the Send/Save/Delete photo screen. Fixed bug that would cause the game to recognize a pool of blood or a corpse behind a wall. Fixed bug that would allow the player to take a “moving photograph”. I’m extremely curious to find out more about the demographic that is interested in Yandere Simulator. Please take a moment to tell me a little about yourself! What do you want the MOST from Yandere Simulator? 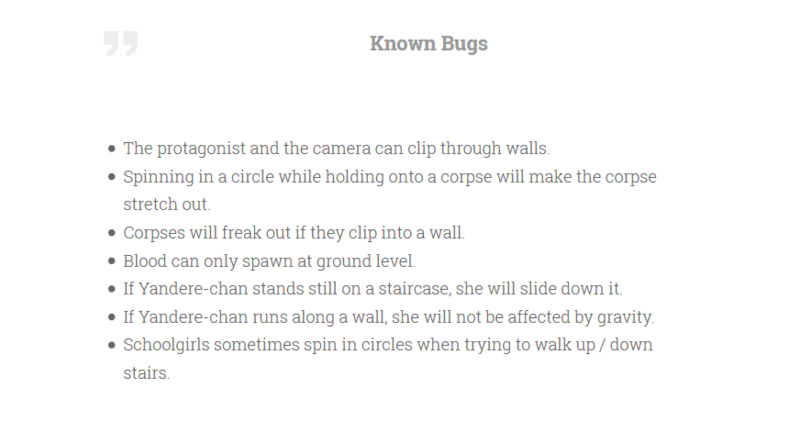 Ever since Yandere Sim started getting lots of attention last month, I have been receiving TONS of bug reports. Most game developers have to pay money in order to get this much bug-testing help for their games! I am very grateful for all of the support and assistance that newcomers to Yandere Simulator have been showing me! 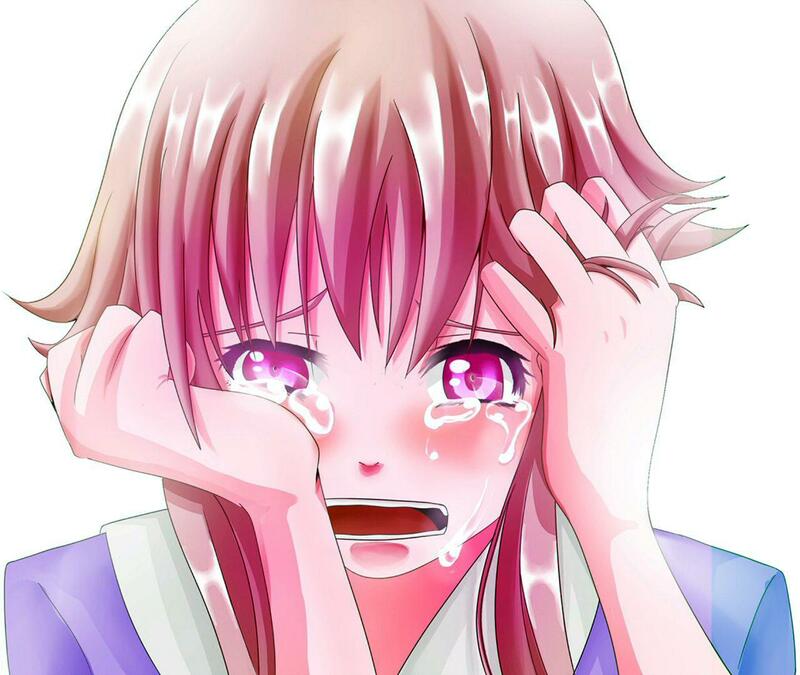 Every time you send an unhelpful bug report, a yandere girl loses her senpai. Please, think of the yandere girls. I was thinking of multiple ways to kidnap schoolgirls, and the only reasons I could come up with for a girl to either, a. willing come to you’re house where you then drug and tie them up, or b. come with you to an unknown location, or c. something I haven’t thought of, would be, admiration, friendship, to study, or because you seem innocent or trustworthy. Now, admiration can come from popularity, getting good grades (also under to study, and to get “good grades” you’d have to get a certain amount of skill points for each subject) or being an older student. Do you see where I’m going? Something useful to add might be grades in the school. Since she is not a freshmen, Yandere-chan should be able to get younger students to do favors for her more easily, and they would trust her more. While also, older students would be less likely to listen to her. I’ve heard that you are going to add a ton of clubs to this game, and I’d like to know if you can join more than one club, and what the max clubs you can join would be. Because you’d seem more trustworthy if you were in a charity club, or an inherently “good” club. And could there be a possibility for a customizable week where you can set the basic AI of the students? Would it be possible to make 2 or more schoolgirls (or guys) be you’re rival in this week? +I think this week should be earned in some way be the character, maybe by a happy ending? For Yandere-chan at least. I’d like to add a “scenario editor” to the game where the player can customize the high school and students. One thing you could Implement to save on pantie shots is be able to join the music club and get almost unrestricted access to the Instrument case. I have a question. dose Yandere-Chan have a family ( I guess she dose because you said something about a family secret)? Still I find it odd she can kidnap someone(shove them in her basement) and get away with that without her family noticing ( or helping/ stopping her). Are you planing to implement a familial presence or something like that in the game or would that be to difficult? I am not complaining just wondering. Also the game looks like it will be fun to play keep up the good work! hay one way to kidnap a girl should be by inviting her to sleep over or dich school. Hi! May I Help You With The Art Work? I Will Send My Artwork To Your Email. 2. Player must obtain CHCL3 (chloroform) from the chemistry lab, similar scenario to the tranquilizer in the nurses office. 3. Player must plant a fake love letter in a locker: Can be forged with high language skill or bought from info-chan. 4. Player must convince a student to meet the rival at the park: Can be done with seduction skill, black mailing, or with help from info-chan. The rival meets the student at the park, and proceed to have a date. At the end of the date, the student brings the rival back to their house, which is actually player’s home. When the rival enters the building, the player is waiting with the chloroform and is able to knock the rival unconscious within her own home. Because that the victim is made unconscious at the players house, the likely hood of escape or being caught by an outsider is extremely low. To balance this, this technique could only work with careful planning by the player. Only a romantic rival would follow the student inside after the date, others being too prude or only having eyes for senpai. The student helping the player is also a risk, depending on the personality or the method the player acquired them with, they may end up refusing to help or snitching on the player. Even if the kidnapping is successful, the student who helped will always know, meaning the player has to either eliminate them, break them, or stay on their good side. Keep up the good work, I can’t wait for the first release of the level editor! I also would love that! Has anyone an idea why the kidnapping is not working yet, i cant access the storage rooms as described in the video.